I wanted a dessert that included fresh berries. 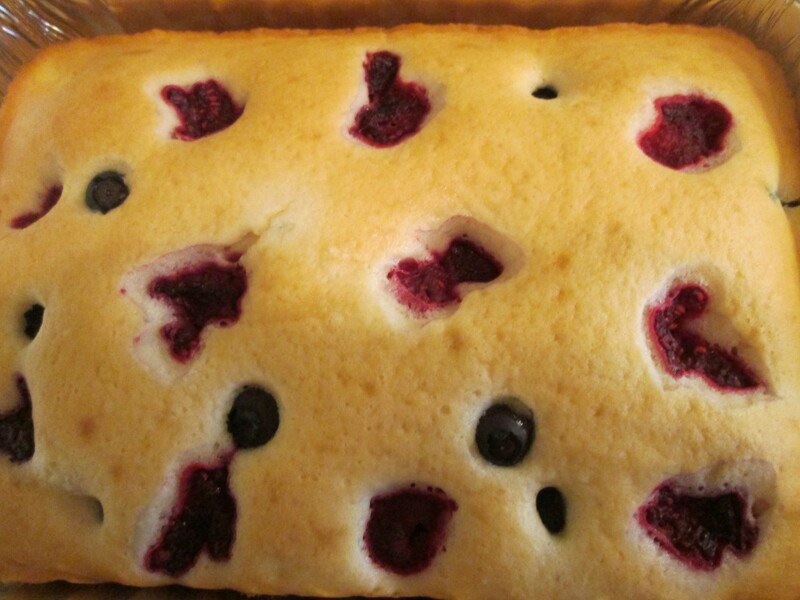 I ended up making a white cake and then studded it with raspberries and blueberries. 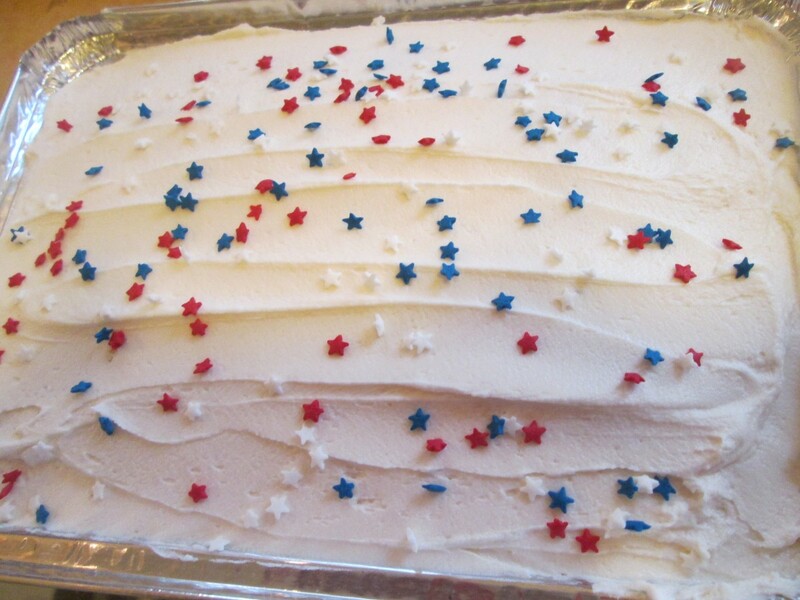 I topped it off with a lemon butter cream frosting and since it was the 4th of July I added a few star sprinkles. 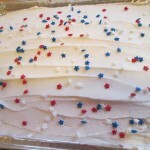 I loved the cake and it was a big hit with friends. 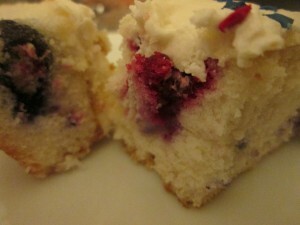 After the cake was all done I decided to call it the Berry White Cake and found myself humming Barry White songs!! To make the cake start by making a white cake batter. 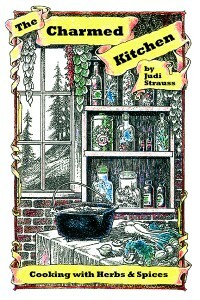 I used homemade -recipe follows- but you could use a box mix if that is what you prefer. After you pour the batter into your pans, or pans, sprinkle with some blueberries and raspberries- or whatever berries you happen to have. 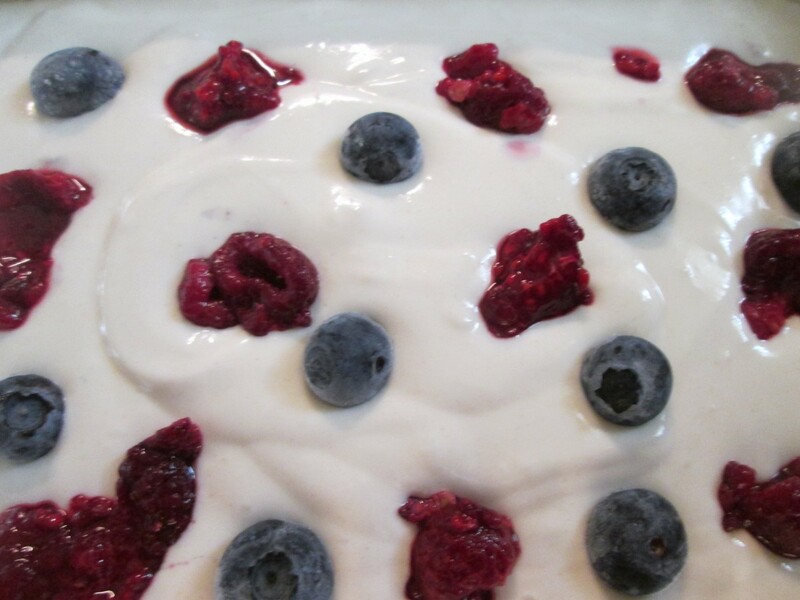 Fresh or frozen berries could be used. 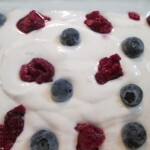 I used about 2 cups of berries in all, maybe a bit more. Once cooled frost the cake. I used a lemon butter cream- recipe follows. Preheat oven to 350 degrees. Lightly grease a 13×9-inch pan. In a medium bowl, cream together the sugar and butter. Beat in the eggs, one at a time, then stir in the vanilla. Combine flour and baking powder, add to the creamed mixture and mix well. Finally stir in the milk until batter is smooth. Pour or spoon batter into the prepared pan. 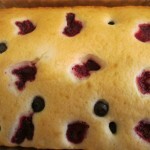 Sprinkle berries over the surface of the cake. Bake 35-40 minutes. Cake is done when it springs back to the touch. Makes 1. Note: I actually made 3 smaller cakes from this recipe- reduced baking time to 20- 25 minutes. In a bowl beat butter until fluffy. Gradually add 2 cups of the confectioners’ sugar, beating well. Slowly beat in the milk, juice and vanilla. Slowly beat in remaining sugar. Beat in additional milk, if needed, to make of spreading consistency.